Our infrastructure is completely-equipped with numerous efficient machines and tools that support us with the obstruction-free manufacture, storage and proper loading & unloading of the proposed assemblage. In order to manage the workspace an all the operations, we have recruited a team of skilled and knowledgeable professionals, who are well-trained to understand and cater to the diversified requirements of our precious patrons, within the committed time period. Since our inception, we have been determined to deliver best quality possible and are proud to have earned a long list of customers, worldwide. Furthermore, we are involved in ethical business dealing only. Under the unparalleled leadership of Mr. Jatinder Pal Singh, we have earned an unmatched reputation among our customers. Due to the constant motivation and regular guidance of our mentors, we have gain immense strength and encouragement to attain our organizational goals. We wish to expand our business in the near future. Manufacturing and Trading of Double Stroke Cold Heading Machines, Automatic Bolt Head Trimming and Shank Reducing Machine, Automatic High Speed Thread Rolling Machine etc. At our location, we have set up multiple kinds of machines and equipment that support us with the hassle-free operations. Our spacious infrastructure facility is categorized into multiple sections so as to separate all the operations from one another, also to carry out the tasks in a co-ordinate manner. Our workspace is managed by a team that also performs several up gradations, on a regular basis. Attaining complete customer satisfaction is one of the major goals of our organization. In order to achieve the same, we make use of fine quality raw materials for the production process and comply with the predefined industry guidelines, to ensure the quality and flawlessness. Furthermore, before the final dispatch, all the products are checked under a series of stringent tests to examine the perfection. In addition to the measures taken, we provide the product assemblage in tamper proof packaging to avoid damages, caused during transportation. Our organization is backed by a team of professionals, who are hired on the basis of educational qualification, years of industry experience and technical knowledge. All our professionals are highly experienced and skilled professionals in their respective fields and strive hard to achieve the exact quality desired by our customers. Furthermore, we carry our multiple training sessions, to enhance the skill and knowledge level of our team. We are considered a trustworthy name in the business, which is widely involved in offering quality grade Fastener Making Machines. Also, our company believes in proffering the best quality possible and attaining complete customer satisfaction. Since our inception, we have focused on delivering the products within the committed time frame. 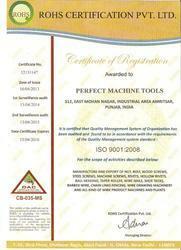 Perfect Machine Tools is one of the preferred choices of our customers and wishes to maintain the same reputation in future as well.